Is it safe for your dog to eat Hot Dogs? Read more to find out. Hot dogs are typically made from pork, beef, chicken, and turkey. All these ingredients are also common in most dog foods. What hot dogs do contain, that high quality dog foods do not, is high amounts of salt and other flavorings that may be harmful to your best friend if eaten in large quantities. Additionally, most hot dogs are usually very high in fat content. If you plan on adding hot dogs to Fido’s menu of treats, you can find all beef low-fat hot dogs in most grocery stores. Hot dogs may be used in small amounts as a training treat or as a just because treat, but should not be part of a dogs regular diet. The artificial flavorings and high salt content, if eaten regularly, can lead to coat shedding, digestive and weight problems, and even cancer. Finally, as with any meat product, be sure to thoroughly cook the hot dogs to kill any latent bacteria. 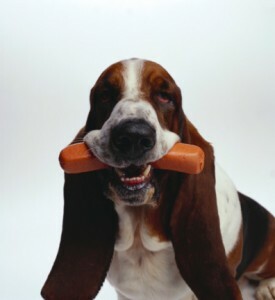 What do other dog owners have to say about whether their dogs can eat Hot Dogs or not? See comments below. Know if dogs can or can't eat Hot Dogs? Help other dog owners by leaving a comment.